I really like making Frittatas. I think they are a pretty cheap dinner even with the price of eggs right now. It is not only frugal, but quick and easy. I usually serve this with a vegetable and a bread. But the great thing about them is they are so versatile. You can add ham, bacon, or any vegetable. Onions or mushrooms are also good. If you add in vegetables the frittata all by itself is a great meal. It is one of those things that you always have the ingredients for. When you need a quick dinner and do not want to spend the money on fast food make a meal like this. It is much cheaper and healthier. This recipe is adapted from a recipe I found on the Whole Foods website. I added a little extra pasta and the milk. I think it made it better. The one pictured has bacon in it. If you have eggs, pasta and cheese, then you have dinner. 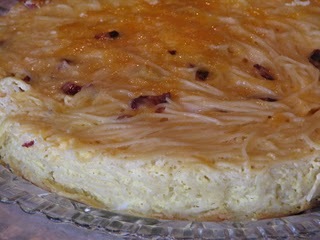 This pasta frittata can be varied so much. You can use leftover pasta, whatever cheese you have on hand, cooked broccoli or spinach or diced ham. Preheat oven to 350°F. Toss cooked pasta with the teaspoon of olive oil and set aside. Oil a 10-or 12-inch ovenproof skillet with the remaining tablespoon of oil. Whisk eggs and milk together and season with salt and pepper. Add grated cheese to the mixture, then stir in pasta. Toss well and pour into the prepared skillet. Bake for 20 to 25 minutes or until frittata eggs are set and no longer wobbly. Let cool for 5 minutes. Serve directly from the pan or invert onto a cutting board. Cut into wedges and serve with a dollop of pasta sauce or salsa, if desired. I emjoy making frittatas too. This one sounds yummy! Sounds like a nice way to use up leftover pasta. That looks really good. It would also be a good way to use up eggs if they are close to the expiration date. Our grocery store often marks down eggs that are expiring in a day or two to $.35-.50/doz. I rarely buy them though because I’m never sure if I’ll be able to use them up in time. This would be great! Can I use a cake pan or a Pyrex pie pan? I don’t have a skillet. Yes, I think a cake pan or pyrex pie pan would work fine. You may want to half it though. It filled up my skillet. We ate if for dinner and had plenty for lunch, so it makes quite a bit. You could also make a regular batch and place in two pans if needed. Wow! That looks yummy! I have never tried making a frittata. I always thought they were hard to do. We may try one of these over the weekend. I love this as a great use of leftover pasta.